It’s a typical, sunny day in the Mushroom Kingdom and with not much happening on the saving-the-day front, Mario and friends are feeling a bit of that summertime sadness. With no threat of impending evil or glitzy go kart tournaments on the horizon, tensions start to rise and egos boil over as everyone argues over who is the Super Star of the Mario universe. But of course, what better way to solve that argument than a good old-fashioned Mario Party? With Toad and Toadette on hand to judge, festivities are just about to get underway when Bowser and his crew interrupt the scene. Will Mario’s arch nemesis attempt to ruin the day for everyone like he did in Mario Party 10? No way! This bunch of baddies only wants in on the competition, and they’ve brought Kamek along to help the Toads with admin duties. It’s time to party! Setup aside, I’m going to go out on a limb and assume that there’s just one bit of information necessary to convince lapsed Mario Party fans to get on board with Super Mario Party: the stupid car stuff is gone. That’s right, traditional Mario Party boards are back (in a main game), baby! For anyone who’s not played a Mario Party game before, the basic gist is this – four players take turns rolling dice to move around a board, with the goal of collecting more Stars than everyone else by the time the game is over. A Star will appear on a set space on the board and the lucky player that passes it will have to hope they have enough coins to buy it, at which time the Star gets moved somewhere else. After every round of turns, players engage in a randomly selected minigame and compete for the coins they need to get ahead and buy Stars and powerups, and then once a set number of turns is up the game is complete and a victor is crowned. It might not matter to everyone, but after a couple of previous series entries toyed with the idea of having every player move around the game board as a group (for some damn reason), it really feels nice to have things back to normal. Of course, Super Mario Party does introduce some new twists on the regular Mario party formula, and luckily they’re worthy inclusions. The most immediate change is that characters now all have the choice of using the traditional six-sided die, with faces ranging from one to six, or their own new character-specific dice. Character dice have unique combinations of face numbers that introduce a risk-reward element by offering a better shot at a preferable roll while also balancing that out with an increased chance of a low number. Luigi’s, for example, goes as high as a seven but has an increased chance of rolling a one, or Bowser’s, which has a ten side, but also two sides that cause him to lose coins. Now, more than ever, it’s possible to try and plan where you hope to land on the board, by utilising dice with odds that suit. It’s a small but very smart addition that takes some of the frustration out of the random nature of a dice-based game without doing away with it completely, in fact it’s probably my favourite tweak to the series’ formula in many, many iterations. Having remixed versions of the boards also goes a little way towards making up for the lack of them, with only four themes in total, which isn’t the end of the world but definitely on the low side compared to previous entries. 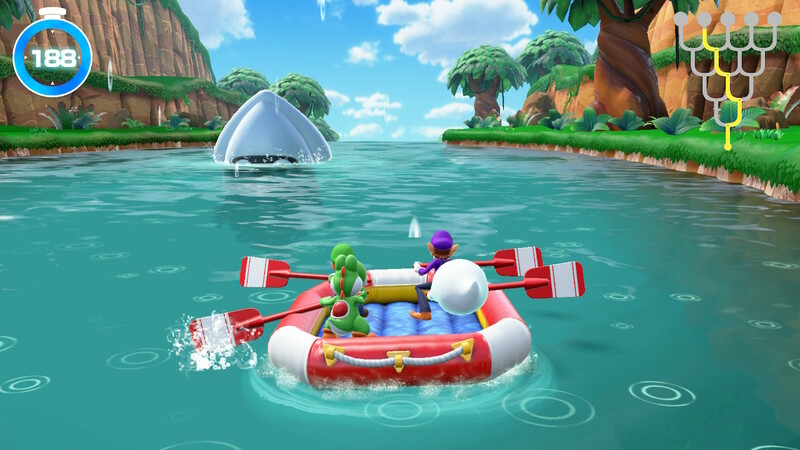 Elsewhere in the standard Mario Party mode, things are largely traditional, bringing the focus back on collecting coins and stars and less on gimmickry. Allies can again be recruited and add an extra dice roll to your character’s turn, and each of the four stages features unique traps and obstacles that spice things up nicely. Where things really shine though, is in the Partner Party mode, which splits the four players into two teams, combining their dice rolls, and remixes each board to allow for free-form movement. With players moving spaces in the double digits each turn, the ability to move in any direction (independently of your team mate) and more ways to grab stars, Partner Party really ups the potential for strategy and devious antics. This is Mario Party at its best, playing couch co-op in teams and strategising on how to railroad your opponents, and losing the plot when a dud roll ruins your perfect plan. It’s situated as a second option to the main mode, but honestly I can see Partner Party becoming the defacto choice among fans. 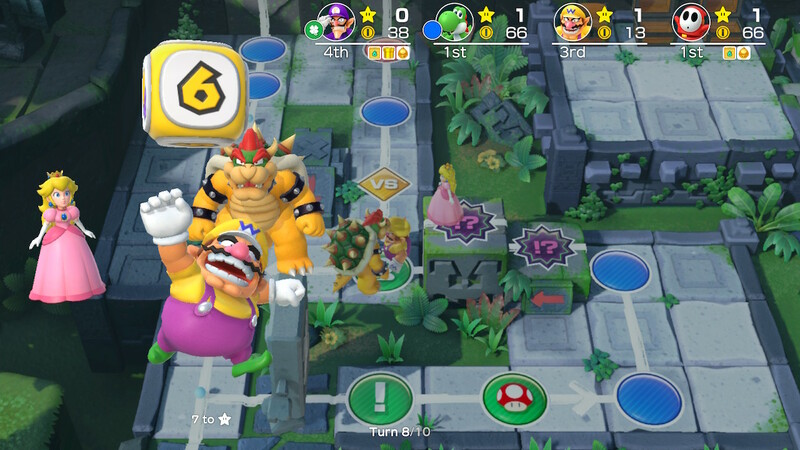 It’s just a shame that there’s no eight-player support in any of Super Mario Party’s modes, some bigger boards and extra teams could have made for some amazing moments. Of course, what would a Mario Party game be without a huge selection of minigames. Capping off the end of each round of the Mario Party and Partner Party modes is a random selection of one of the 80 new minigames, and there’s a lot of fun to be had in this new batch. Developer Nd Cube have wisely enforced a single method of control for Super Mario Party – a singular Joy-Con per player. Making this the sole way to play not only keeps things nice and consistent (as well as ensuring every Switch owner has enough controllers to at least play two-player games) but keeps the minigames tight and accessible while still taking advantage of the Joy-Cons unique capabilities. Motion controls are a big theme, of course, but there are still plenty of minigames that use traditional button controls, as well as some great games that utilise HD rumble. As usual, not all of the games are hits but there are decidedly fewer misses this time around, and some absolute gems. Highlights include Slaparazzi, a game where players fight it out to be in the centre of a Koopa paparazzo’s photo, and Nut Case, where teams pick up wooden crates and use HD rumble to try and determine which ones contain the most acorns. Did you steal this from Team Rocket? There are a bunch of rhythm-based minigames too, and they can be played on purpose in a mode called Sound Stage which mixes them into a short-form musical performance that’s a ton of fun to play with friends in-between proper sessions. River Survival is another new mode that tasks players with rowing a raft together (teamwork is harder than it sounds!) and attempting to reach the bottom of the river against a timer that is refilled by succeeding at team-based minigames. While both of these new modes are fun diversions, they’re not compelling enough to be the main drawcard, but do make great palette cleansers. There’s even a solo play option in the form of Challenge Road, which simply asks players to complete all 80 minigames in succession (not necessarily in one sitting, thankfully) with varying extra conditions to keep things exciting. Probably the most interesting, but slightly disappointing mode is Toad’s Rec Room. Interesting because it makes exclusive use of the Switch’s tabletop mode and its own unique minigames to provide some cool experiences that can even span multiple screens. But its disappointing because the multiple system stuff requires two copies of the game, and when everything else is perfectly playable with one, it’s probably not worth sourcing a second copy just for one gimmick. There’s also Online Mariothon, which pits players against each other in a gauntlet of minigames. As we were playing an advance copy of the game there wasn’t an online community on hand to test this out with, but it should do pretty much what it says on the box provided there are no serious network foibles. So there’s a ton to see and do in Super Mario Party, and it all comes together in the Party Plaza, where your chosen character/s get to meander around, select game modes and chat to staple Mario characters. Exploring the Party Plaza can even lead to chance encounters with extra playable characters to recruit (four bonus characters for a total of 20 in the game), unlockable music to listen to and stickers to collect and arrange on sticker boards. There’s a soft ‘ending’ to the game as well, requiring players to collect five gems that are handed out for thoroughly playing through everything available. 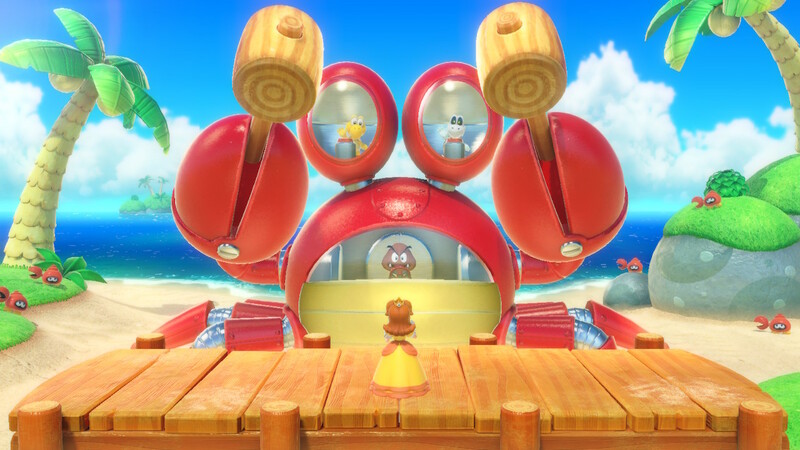 Of course being a first-party Nintendo title everything looks and sounds fantastic, even managing to stray from some of the garishness of recent Mario Party titles. Really, the only criticism I can level at the game’s presentation is that Toad is a really overbearing party host and loves to really slowly explain everything that’s going on. In a multiplayer setting I could already see other players subtly trying to smash buttons in the hope that they’d find a way to skip things, and as usual in solo play it’s a chore to watch CPU opponents trudge through their turns. That’s a small gripe among everything the game does right though. Super Mario Party is a huge success and a definite high point for the series. Some more boards wouldn’t have gone astray but a more traditional, and more strategic main game offering, with top-notch minigames and a respectable swathe of extra modes make for a sure-fire party hit and a perfect use of the Switch’s unique properties.